Spilsby Town's Wes Elston slips a pass beyond Ben Parkinson of Fishtoft. Spilsby Town remain top of the table following a 3-0 home win against Fishtoft. Goals from Josh Wood, Jordan Turner and an own goal secured three crucial points. Wyberton Reserves also scored three goals in their away match at Billinghay Athletic to keep hot on the heels of the leaders and, with two games in hand, it is building up to an exciting finish. Harry Wright grabbed Billinghay’s first half goal as they held the visitors 1-1 at the break before Wyberton snatched victory with two second-half goals. Wyberton goal-scorers were Shane Brackenbury, who grabbed two, and Liam Shinn. The victories help set up a much anticipated table-topping clash at the Causeway this Saturday, when Wyberton Reserves play hosts to Spilsby Town. Coningsby enjoyed their trip to Swineshead, returning home with a 2-1 away win under their belts. Lee Gemmell and Shaun Boothby hit the matchwinning goals for the visitors while Rob Masters replied for Swineshead. Old Leake came away from Ruskington Rovers empty-handed after being deservedly beaten 2-0. Mitchell Gorman and Sam Jackson scored the matchwinning goals with the opener coming after just two minutes. Old Leake played much better in the second half after a dismal first period, but Ruskington were defending well to deny any threats. When Old Leake were presented with a golden chance to get on the scoreboard after being awarded a penalty they still couldn’t find a way through as the Ruskington goalkeeper pulled off a decent low save to keep out Scott Mackay’s spot-kick. Kirton Town had a dismal afternoon when they entertained Skegness Town Reserves, conceding eight goals in an 8-1 trouncing. Josh Whittam hit four of the Skegness goals while Charlie Arabin, Dan Field, Michael Parnham and Max Forman completed the rout. FC Wrangle put up a brave fight at Old Doningtonians before going down 4-3. Chris Wing hit two of the Dons’ goals while Ben Wood and Luke Barnett also got on the scoresheet. Woodhall Spa United looked to be heading for a share of the spoils when they played hosts to Friskney as the game entered the dying seconds, but then a heart-breaking own goal gave the visitors all three points in their 2-1 away win. Kieran Richardson’s goal gave Woodhall some hope before Friskney spoiled the party. AFC Tetford hit Eastern European FC for six in a 6-2 home win. Nathan Wright was once again the king-pin for Tetford hitting five of his side’s goals while Jimmy Harris was also on target. Swineshead A suffered a crucial injury blow when they lost striker Dean Seiner after just 10 minutes, but they recovered to take all three points following a fine 2-0 victory against Park United. Swineshead included five 16-year olds in the line-up and their energy levels played a crucial part in their team’s lively performance. Park competed well during the first period and they managed to keep their opponents out in a goalless first half, but Swineshead deservedly broke the deadlock on 70 minutes when Liam Mead scored. And they doubled their lead towards the end - Mead netting his second goal of the game. Park’s central defender squandered a great late chance when he shot tamely at the keeper when well placed. Mareham United rocked title-chasing Railway Athletic when they opened the scoring through Paul Flesher inside the first minute. Railway slowly got into their stride and three goals in the final 10 minutes of the first half put them in firm control. Goals came at regular intervals in the second half as Mareham tired and Railway ran out 9-1 winners. The Railway goals came from Chris Moore (three), Damian Gibbons (two), Danny Woods (two), Brandon Norman and Liam Wilson. Holbeach Bank’s injury curse struck for the second successive week when a head and neck injury to their goalkeeper after 30 minutes resulted in a premature abandonment of their home match against Sibsey as they waited for the Notts and Lincs Air Ambulance. The likely outcome will be a re-arrangement of the match. Benington Reserves held FC Hammers to a 1-1 draw with Jason Cade getting on the score-sheet. Benington could have snatched all three points when they were awarded a penalty but Dean Stevens failed to find the net. Friskney Reserves appear to have resolved their recent selection problems to help them complete their season when they gained all three points in their home match against Boston Athletic. Ben Leech scored during the first half to give his side a slender 1-0 half-time lead. 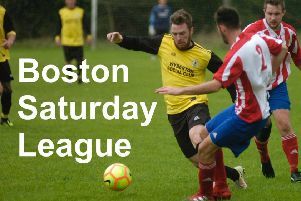 The points were made safe in the second half when Peter Colby grabbed two goals to put Friskney firmly in control before Boston Athletic pulled a goal back two minutes from time following a free-kick to make the final score 3-1. Friskney veteran Pete Holland did have to perform as stand-in goalkeeper during the first half before their regular goalkeeper turned up at half-time, but they can now look forward to finishing their season in style. Zac Mercer got on the scoresheet for Spalding Harriers, but it wasn’t enough to prevent Nothgate Olympic from taking maximum points following a 2-1 away win. Northgate’s goals came from Chris Bradford and Ciaran Cullen. The game between Leverton Reserves and Boston Titans never really looked like getting out of gear as both sides toiled away. Leverton’s defence was looking particularly strong and the home side were also winning the midfield battle too, but failed to provide many clear-cut openings. Leverton’s Nathan Greenfield came closest with a header which was saved well. The scrappy nature of the first half continued into the second and both teams kept up with the niggling challenges in what was an otherwise uneventful game. Boston Titans did create a few chances, one of which saw a shot cleared off the line, although Leverton had an effort ruled out when Dec Reed was adjudged to have fouled Titans’ keeper as he headed home on the line. Aside from these remote chances and a late heated clash of players which saw a booking for the away side, the game fizzled out to a 0-0 draw. The final of the Willoughby Shield will be contested by Coningsby Reserves and Spilsby Town Reserves at Boston Town’s DWB Stadoium on April 26 (KO 7 pm). Division Two outfit Coningsby Reserves had the easier victory on the day when they caused an upset by defeating Swineshead Reserves, from Division One, 3-0 thanks to goals from James Todd, Danny Cottingham and Martin Lynch. Spilsby Town Reserves, leading the way in Division Three, had to rely on a single Jay Adams goal to see them through in a closely fought 1-0 home win against second division side, Pointon Reserves.